With just over a month left until the Xbox One launch, the rumors about as-yet-unannounced details continue to fly. Two weeks ago, the word was that the Xbox One’s bundled Kinect camera could be used to harvest lucrative data about console owners and their homes — a claim that Microsoft vehemently denied — while leaving the door ever so slightly ajar in case its policies change. There appears to be a larger morsel of truth to the latest rumor, sparked by the Dell website and noticed by Engadget yesterday. 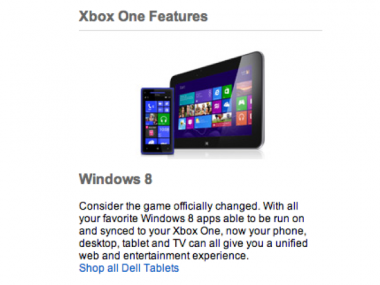 “With all your favorite Windows 8 apps able to be run on and synced to your Xbox One, now your phone, desktop, tablet and TV can all give you a unified web and entertainment experience,” the page still reads. A Microsoft spokesperson said that’s not quite true: “The suggestion that all Windows 8 apps run on Xbox One is not accurate,” they wrote in an email. That’s not a confirmation that any specific apps will work across both devices without additional fiddling on the developer’s part, of course. And the company has said in the past that the similarity between the Windows and Xbox operating systems should make it possible to write Xbox apps that strongly resemble their Windows counterparts. But it leaves open the possibility of universal apps that could help prop up the Windows 8 ecosystem with Redmond’s robust gaming brand.